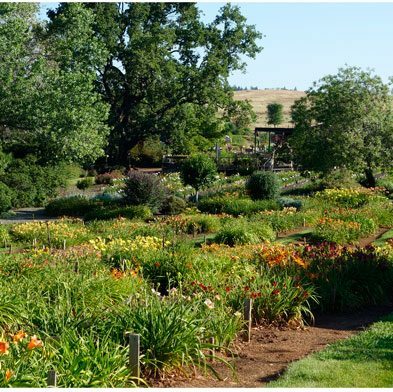 A celebration is planned for Amador Flower Farm’s Daylily Days weekend as more than a million flowers bloom! Join the flower farm family for picnicking, demonstrations, shopping, garden-wandering, and free tram ride tours of the farm. There will be hourly gardening demonstrations, garden art artisans, and idea gardens full of unique perennials to delight visitors. Gardening demonstrations about daylilies, the art of bonsai, and unusual air plants will interest curious gardeners. Food will be available for sale from our local 4H kids. They’re fundraising by cooking up hamburger and hotdog lunches that include chips and a bottle of water for $6, or folks are welcome to pack a picnic. The 14 acre farm is alive with color at this time of the year as the daylilies explode in shades of red, orange, yellow, pink, purple and more. Stroll the garden paths, find inspiration for your own garden, relax under the oaks, and join in celebrating the Daylily! This event is open to the public with no admission fee. Sorry, no pets allowed.